"The Gem That Caught Fire" is the second in the Shadowsfall Legends line of short tales taking place on the Plane of Shadows. Now available in PDF, ePub, and mobi (Kindle) formats. Chaotic Neutral is too fun! The Gem that Caught Fire Sports your typical nonhuman mad scientist type of Chaotic Neutral tinkerer's mayhem. Alchemy, if I do say so myself, is an under-utilized craft throughtout Pathfinder games; and a goblinoid throwing bombs like Link in a china shop reminds me in particular of how a little chaotic comical mayhem can really make a game interesting. I'm already liking the overall nature of the Umbral Kobold now that I've seen it fleshed out in a story like this. The taunting demeanor mixed with a need to sow a certain amount of chaos makes any character more fun to watch. I particularly like the imagery I get from the description of the city buildings here; very Tim Burton esque. Shadowsfall is really shaping up to be a nightmare before christmas meets assassin's creed type flavor; and that's always the best kind of city to play in. I whol-heartedly approve and I intend to share Shadowsfall with any group I can get my hands on. A kobold alchemist, what could be better? Kurdag is a male umbral kobold alchemist with a penchant for explosions. He owns an alchemy shop called The Exploding Herb in the town of Blackbat. When a human adventurer comes to his shop with questions about a gem that caught fire, he ends up in a struggle for his life. That's fine with him, though; it means he gets to throw his beloved bombs. This story deals with a main character who is not especially well liked by the people around him. They tolerate him because of his prowess at making (and throwing) bombs and other alchemical creations. Like all kobolds, life is a struggle, but Kurdag has done better than most. Despite that, he is still discriminated against by a human adventurer (though not for too long). 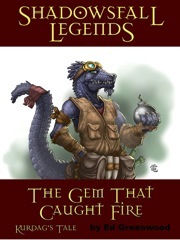 There is a fast paced, exciting battle between the kobold and some enemies. It will certainly keep you turning the pages (or scrolling down) to find out what happens next. The story gives you a good feel for what towns and cities in Shadowfall are like. Although the citizens band together for safety from the undead that stalk the wilds of Shadowsfall, the citizens are also their own worst enemy, quarreling amongst themselves when not combating hosts of undead. I enjoyed the story enough to read it through more than once. I will be sure to come back to it as the other Shadowsfall Legends come out. The Shadowsfall Legends are shaping up to be high quality short stories. These compete with Paizo's Web Fiction for quality of author, story and characters. If you enjoy the web fiction, I highly recommend picking this story up. Editing was top notch. I did not see any spelling, grammar or punctuation errors in the entire piece. Priced at $0.99, this is a perfect impulse buy, especially if you are planning to pick up the Shadowsfall campaign setting. I was very pleased to note that it came as an ePub, PDF and mobi (Kindle format) file. I'm no fine critic of literature, but I greatly enjoyed this short story by Ed Greenwood. The idea of umbral kobolds tickles my fancy, especially one that still has a shop exclusively because people are too afraid of his bombs to run him out of town. After reading the story, I immediately tried to figure out how to make this into a possible encounter for my players. That said, there were some oddities in the text, such as areas where it was clear the kobold was speaking outloud, but the text wasn't in quotation marks. Plus, it's an awesome introduction to the Shadowfall setting! Now available at Paizo.com. The PDF is written by Ed Greenwood and is 14 half pages long. Yes, the Umbral Kobold is a new race found in the Shadowsfall: Shadow Plane Player's Companion due out later this year. I'm really glad you enjoyed it Cheapy. Care to share your thoughts in a review? I just want to say "Thank you" to Itchy for the awesome 5/5 review!!! Now I'm wondering if not using quotation marks is sometimes OK, especially if Itchy didn't notice any issue. I think it's a DC 20 Will save to avoid being confused, as the spell, by thinking about the intricacies english language. I didn't notice any areas in the PDF of the story where someone was speaking and quotation marks weren't used. Did you know that you can read this story, written by Legendary Author Ed Greenwood on your iphone, ipod, ipad, android phone, android tablet, kindle, kindle fire, nook, or any other device in addition to your computer? Download it today! I just want to say thank you to Carnageant for an awesome 5-STAR REVIEW. Be sure to read this story yourself and find out what these reviewers find so awesome! This story written by Legendary Author Ed Greenwood is still fun and enjoyable, no matter what edition of Pathfinder you play.